Is Talkshow the new Peach? The new text messaging app became the hottest new social media app of the week. Similar to Periscope, Talkshow’s can be viewed live or once they have finished allowing users to share conversations, post reactions and co-host another Talkshow. 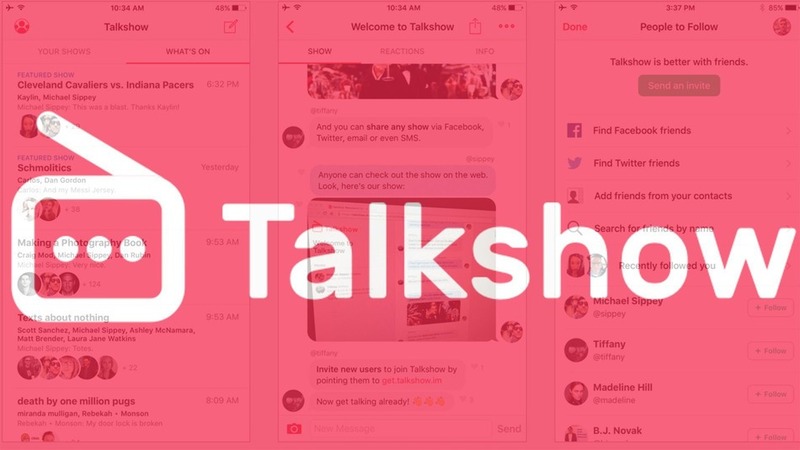 Where Talkshow differs from messaging apps such as iMessage and Whatsapp is that each stream is publicly released like a radio broadcast with users able to read in real-time or after the event. In the latest figures released by Snapchat it appears that its users can’t get enough of the video sharing platform with 10 Billion videos being watched daily. This is a 25% increase from February where the figure was 8 Billion. With users spending on average 25 – 30 minutes on the app each day, Snapchat is quickly growing into a viable marketing channel for businesses. Yet another Facebook camera app looks to be in development failing the 3 previous failed attempts. In yet another attempt to challenge Snapchat and get more users sharing photos and videos as well as live streaming video the new app will make it easy for users to jump between these features. Will it be fourth time lucky for Facebook, or will this be another potentially expensive crash for the social giant? A new ad format is coming to YouTube which will not give users the options of skipping. This short 6 second format will be available to purchase through the Google Ads platform and will guarantee advertisers that users will be seeing all of their video ad content. The new ad unit will be called “Bumper” and will be shown to phone and tablet users. A new label has been added in the Google Play Store to highlight apps which contain adverts. Similar to the existing In-app purchases label, now users will be able to see if an app contains adverts before choosing to install them. This move will help bring more clarity to users and may help influence purchase decisions for new apps.